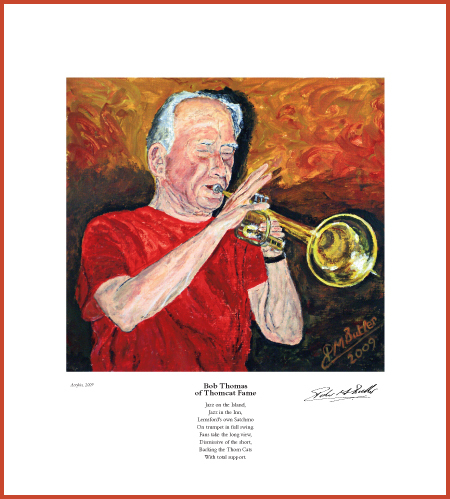 Jazz&Jazz Fine Art Print of Bob Thomas. 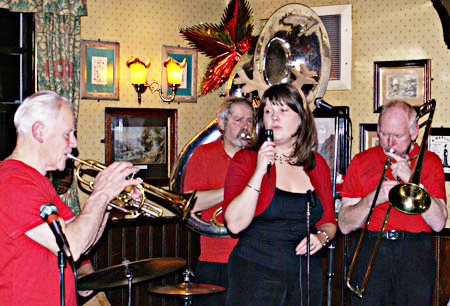 The poem was aimed at keeping live jazz in the village pub. It reads: Jazz on the Island, Jazz in the Inn, Lemsford’s own Satchmo On trumpet in full swing. Fans take the long view, Dismissive of the short, Backing the Thomcats With total support. passing of jazz trumpeter, Bob Thomas, aged 86. Happy Days! 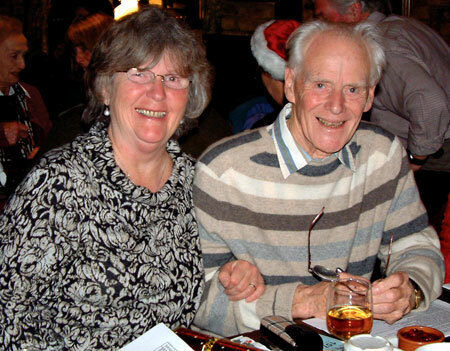 Bob and Hazel at a Lemsford Village Christmas Party in 2009. I have a very special place in my heart for Bob and Hazel. We were neighbours in Lemsford village for years until Ginny and I moved away in 2013. I’m so glad that I visited them just four weeks ago. Bob wasn’t too well then but I spent an hour reminiscing with him and he brightened up considerably. I supported Bob when he strove to keep jazz live and alive at The Long and Short Arm public house in Lemsford, now so many years ago, and have featured him and his band, Bob Thomas & The Thomcats, several times on Jazz&Jazz (links below). I have so much to thank Bob for because he acted as my mentor when I got back into jazz over a decade ago. I spent long hours with him in his home on the banks of The River Lea in Lemsford and at “The Old Orchard”, our own home in the village, catching up on the jazz scene. He was a wealth of knowledge. Plus he had a heart of gold and huge community spirit, playing with his beloved Thomcats at Lemsford Village fundraising events, at the Lemsford Village fete as well as mixing in with the villagers during the annual river bank clearances, even with waders in the River Lea. Bob & The Thomcat’s playing at Lemsford’s Jazz On The Island fund raising event. 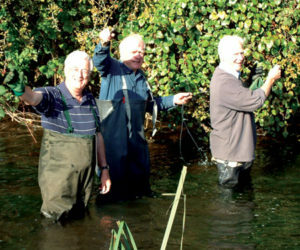 Pranks in the River Lea, (left to right) Philip. me and Bob during a Lemsford river bank clearance. When jazz came to an end at The Long & Short Arm, Bob and I went to The Peartree Jazz Club in Welwyn Garden City run by Brian Smith (Smiffy) and then, until Bob’s health deteriorated, we switched to Smiffy’s Lemsford Jazz Club. Back in 2009 I painted Bob’s portrait on trumpet. 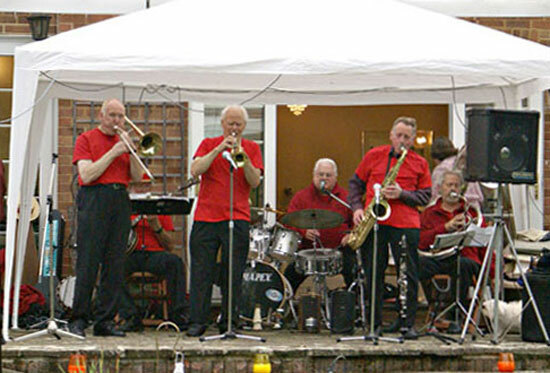 It was all part of our campaign to keep live jazz in Lemsford. So it was a happy day for Bob when jazz did return to the village at Lemsford Jazz Club. To cap it all, Ginny schemed with Bob to organise a very special treat for my 70th Birthday Party. Smiffy and my close jazz friend Roger Pout had lured me away to the Long & Short Arm for a celebratory drink. When we got back to “The Old Orchard” the house was filled with family, villagers and jazz friends – PLUS Bob and two of his musicians set up in the lounge alongside my father’s piano (a piano which Bob tuned, by the way) to provide top rate entertainment. Bob, Smiffy and myself with Acker in happier days. I had just been reading Topix Stars item “23 Legendary Stars Who Tragically Died in 2016” when Hazel telephoned me with the sad news. Add Bob’s name to that number. So sad to have lost such a great friend and musician. I loved every minute of the ten years I was privileged to play with him in the Thomcats. Sorely missed, a grand old man of Jazz. Tim, thank you for this. Like you, Ginny and I will sorely miss Bob and our sympathies go out to Hazel. I’m so glad I visited them both in early April. Bob loved their cottage by the river and watching the fish waiting to be thrown treats. I will never forget him walking to the gate to bid me farewell for the very last time. So sad to hear of Bob’s death. I was with him from the first Thomcats gig until the last, and enjoyed it all immensely. I was playing only in the Bon Temps Playboys Cajun band at the time that Richard Sharp, a bass player, with a foot in both the Cajun and Jazz camps, introduced me to Bob, as they were getting a band together. So Bob gave me a break, back into the Jazz scene. He put a lot of work into organising the gigs, and those at the Long and the Short Arm were always very popular, (until a soul-less anti-jazz landlord stopped it all). He was a good friend, very generous, amusing, and always very good company. He touched a lot of people’s lives with his warmth and welcoming cheerfulness. I will miss the Thomcats, but most of all I will miss Bob. Amen to each and every word you’ve posted here, Roger.